Our hostel is just by the castle in a full restored XIX century building, with a big terrace with an amazing view over Lisbon's rooftops. It’s a true Portuguese house full of charm, where tradition and comfort meet perfectly. You will feel the Lisbon touch! We organise Portuguese Dinners, Surf and Yoga classes, Tours, with pick-up at the hostel. We have Central Heating! 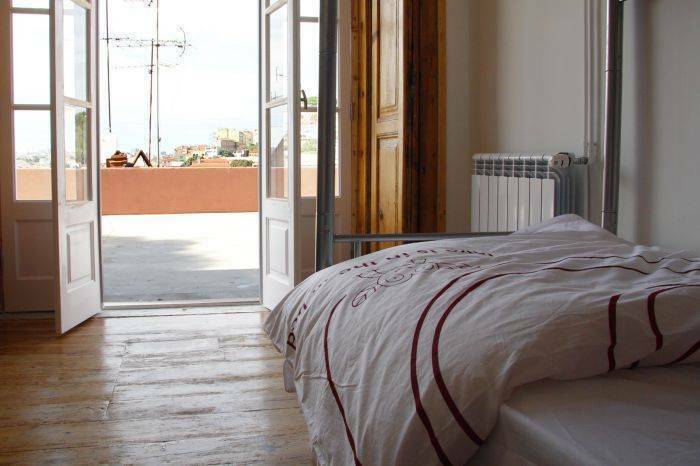 This is Lisbon Hostel has 7 rooms and 1 apartment named and decorated with typical Lisbon themes - Miradouro, Tejo, Azulejo, Pessoa, Fado, Sardinha & Saudade. To give you the best choice, our rooms are all newly refurbished, with top quality mattresses, central heating and enough space to make your stay a pleasant one. To keep the original character and unique atmosphere we restored the original lovely wooden floor and door arches and used the traditional Portuguese Azulejo. In Portugal, the living-room and the kitchen are the heart of the house, where family and friends meet to eat and relax at the beginning and end of the day. Here you will find all the amenities to start your day, beginning with a free continental breakfast and information on how to prepare your discovery of Lisbon. At the end of the day you’ll find a big sofa or sun loungers to sit down while meeting people, drinking something from the bar or just reading a book! We also have a cinema, often showing movies filmed in Lisbon, offering just another way to know our city! The common kitchen is fully equipped with kitchenware and basic cooking ingredients. If you don't feel like cooking, don't worry, we have Portuguese dinners available, made by a Portuguese chef, giving you an opportunity to taste a real home-made traditional meal! Sundays it’s live music! We also provide personalized as well as free tours. 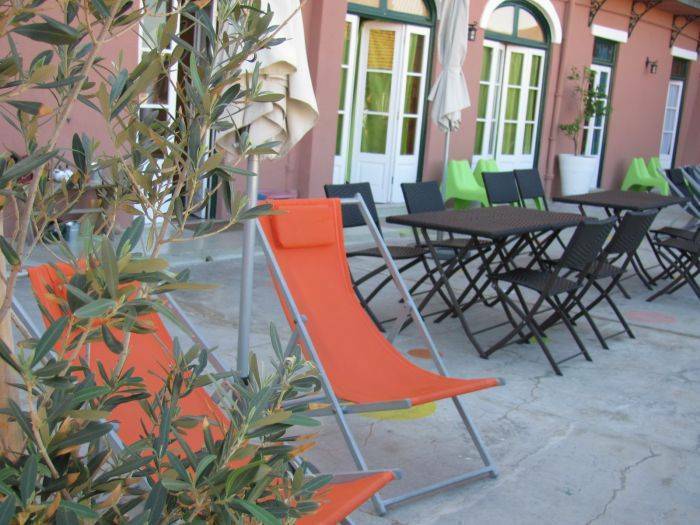 Our huge terrace is the hostel’s main attraction! 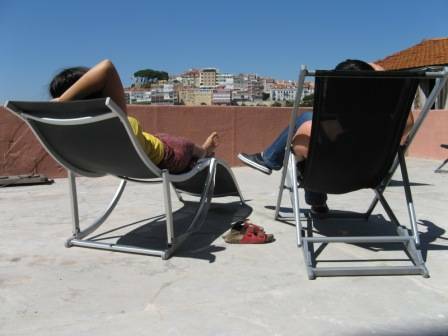 Here you can relax and sunbath while writing a postcard, sharing your experiences or just appreciating the view over Lisbon and the bells of Graça Convent. It is the perfect spot to rest after a busy day in the city. We have internet computers as well as free wireless internet in every room. And our fantastic staff will be here 24-hours to help you with everything. 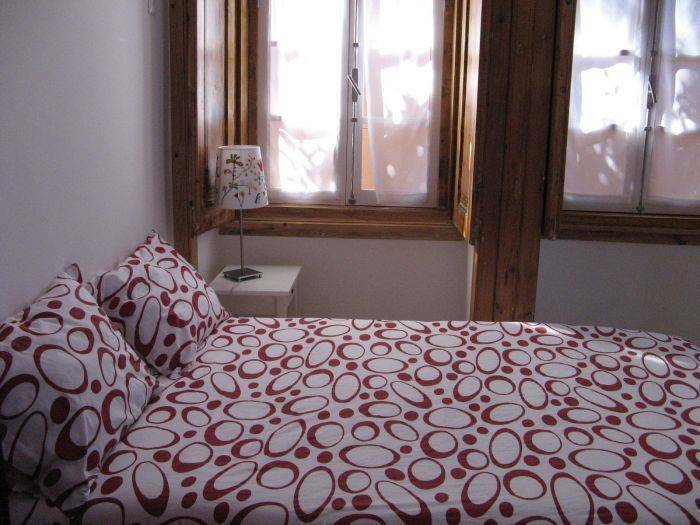 This is Lisbon Hostel is a place full of charm, where tradition and modernity meet perfectly! 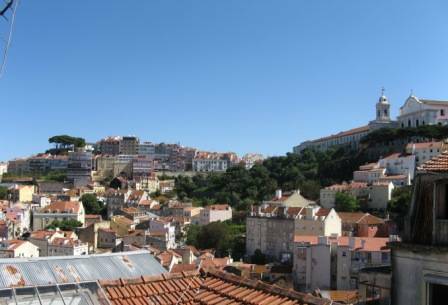 This is Lisbon Hostel is located in the old town district of Mouraria, just outside the wall of Castelo de São Jorge, the Lisbon's Castle, with an amazing view over Lisbon's rooftops. The Mouraria district, one of the oldest "bairros" in Lisbon, birthplace of Fado, is the best example of a neighbourhood where popular Portuguese traditions are still alive, while becoming a meeting point of people from many cultures, from different continents. We are in walking distance from all interesting points from downtown Lisbon, like the São Jorge's Castle, the old Arab neighbourhood Alfama, Graça and its beautiful view, the commercial Rossio, the trendy Chiado and Bairro Alto and Bica with its brilliant and amusing nightlife. Catch the subway at the AIRPORT, change in Alameda to the Green Line and step out at ROSSIO station (runs between 6. 30am until 1am). Walking: exit metro through square Praça da Figueira, follow the tram rails along street Rua dos Fanqueiros until number 170, take the free Elevator to the castle (open from 9am to 9pm), exit and turn left. You will see a new white building with a "Pingo Doce" Supermarket; inside there is another public elevator that takes you to our street (works 24 hours)! Go left on street Costa do Castelo and after 400 meters, you see us in a dark pink building. After 9pm go from square Praça da Figueira direct to street Rua da Madalena and then take the elevator (which works 24hours as parking garage) to our street Costa do Castelo. Taking Tram 12E: exit metro through square Praça da Figueira, catch Tram 12E (runs from 8am until 8. 45pm) and step out at stop Rua Sao Tome (first stop after the tram stops climbing!). Walk backwards along the tram line until you find second street to the left Rua Costa do Castelo (there is a sign pointing to Teatro Taborda, follow it). 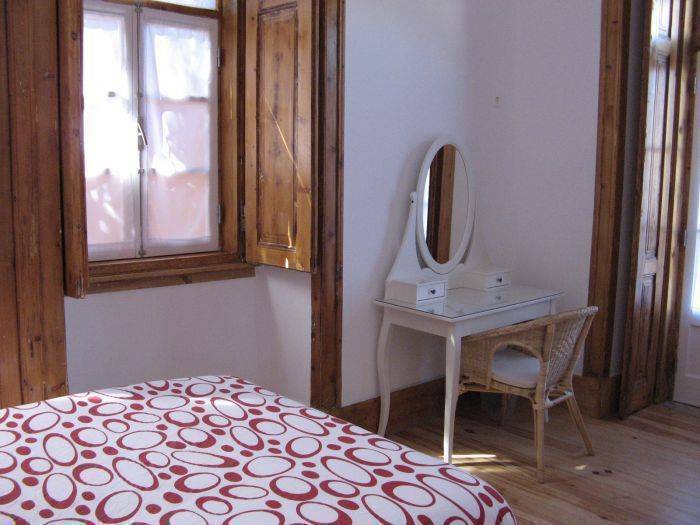 Walk 300 meters along our street, passing the Hotel and the Teatro Taborda, and you will see us in a dark pink building. Taxi from the airport should not cost more that 15euro. Always ask for a receipt. We recommend you to buy a Taxi Voucher at the airport. Or catch AEROBUS and stop in Rossio Square or NIGHT BUS 208 (runs between 11. 30pm and 4. 30am) and stops at Square Praça da Figueira. Then follow above directions. Catch the Metro until BAIXA/CHIADO, exit through Rua do Crucifixo, go straight ahead in street Rua da Vitoria until the free elevator to the castle. Then follow above directions. Or take Bus 759 which stops in Rossio square. Follow above directions. Taxi should not cost more that 7euro. Always ask for a receipt. Catch the Metro until ROSSIO or Bus 759 which stops in Rossio square. Follow above directions. Taxi should not cost more that 12euro. Always ask for a receipt. Catch the Metro until BAIXA-CHIADO, exit through Rua do Crucifixo, go straight ahead in street Rua da Vitoria until the free elevator to the castle. Then follow above directions. Or catch the Night Bus 205, which stops in Rossio square. Follow above directions. Taxi should not cost more that 15euro. Always ask for a receipt.